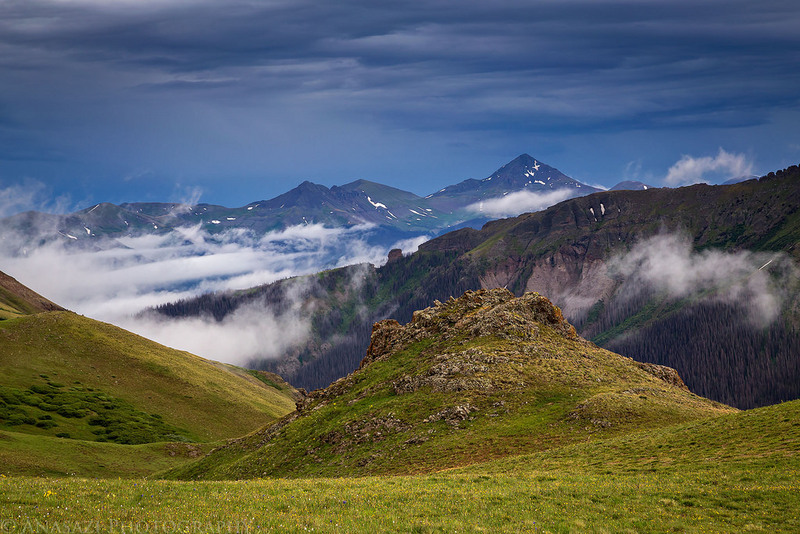 Low clouds cling to the hills along the Continental Divide looking toward the Rio Grande Pyramid. 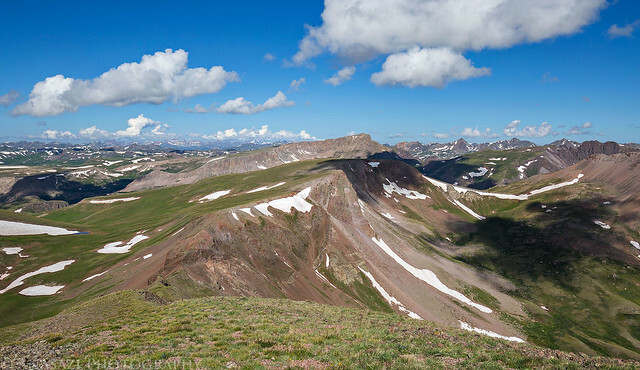 We left home mid-morning on Saturday and drove to the Independence Gulch Trailhead just a few miles short of Lake City where we went on a short but steep hike up into the Uncompahgre Wilderness. 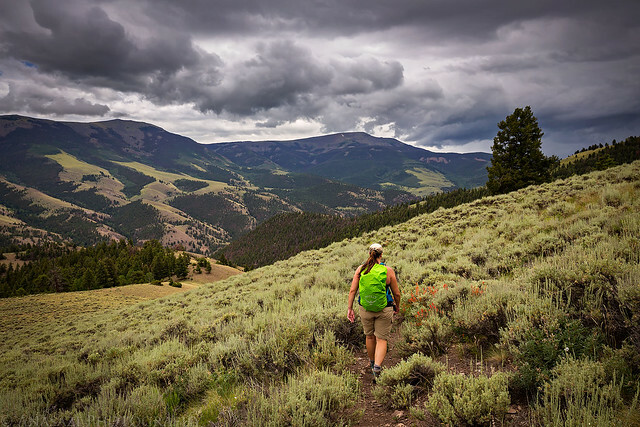 The top portion of the trail opened up into a big clearing as thunderstorms started moving into the area, so after about two miles and over 1,200 feet of elevation gain we decided to turn around and head back down. It was a good steep hike that helped us get acclimated. 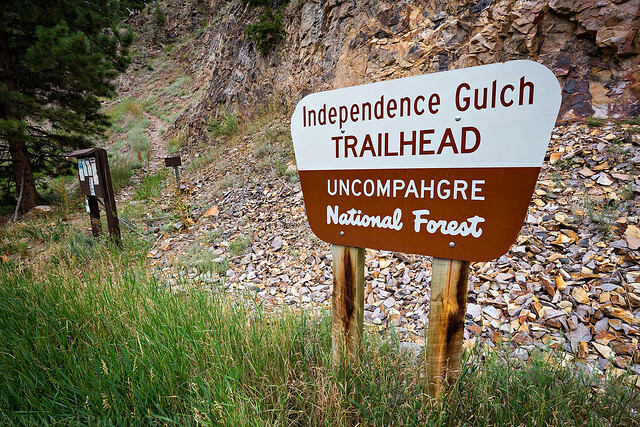 Our first hike was the Independence Gulch Trail just outside of Lake City. 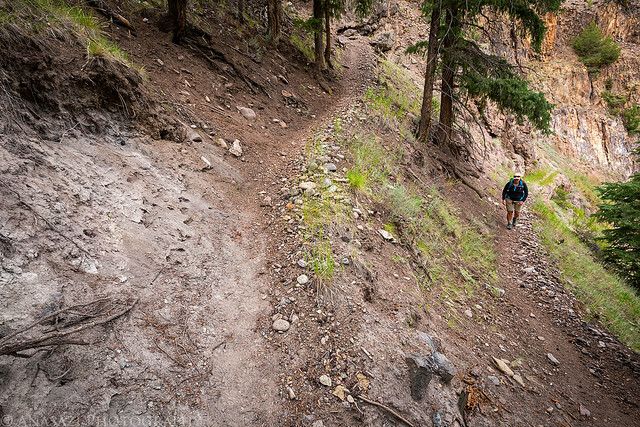 Switchbacks at the beginning of the trail as it climbed into the Uncompahgre Wilderness. I don’t recall ever noticing this type of wildflower in the mountains before, but there were plenty of them along this trail. 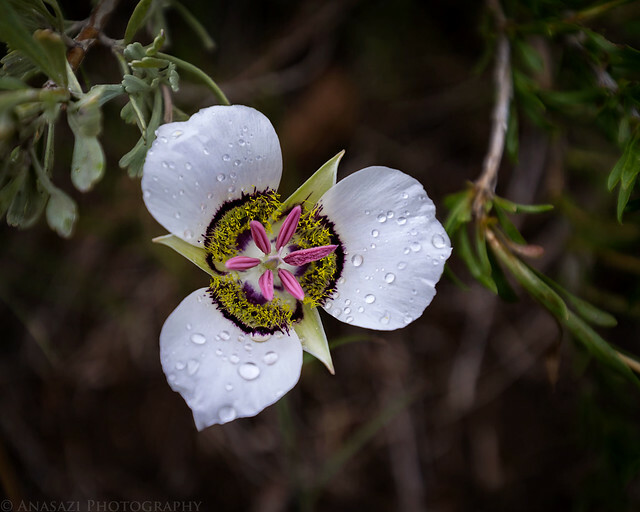 According to a few friends it is a Mariposa Lily. Hiking back down the open part of the trail as storms moved into the area. There were nice views of the Cannibal Plateau and Mesa Seco across the valley. 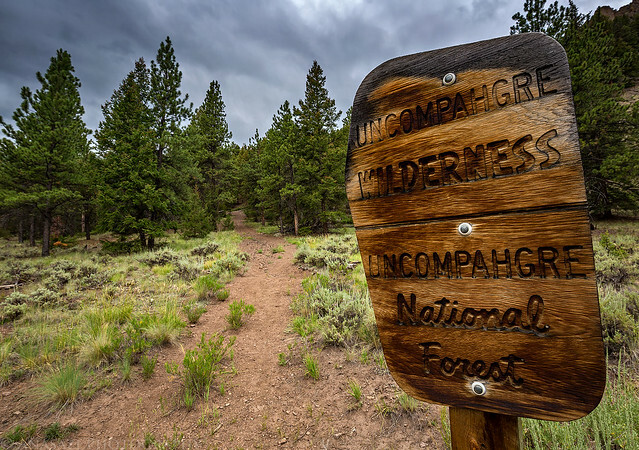 Leaving one of my favorite wilderness areas to explore. Until next time! After cutting our hike a little short we returned to the Jeep and had the rest of the afternoon free. 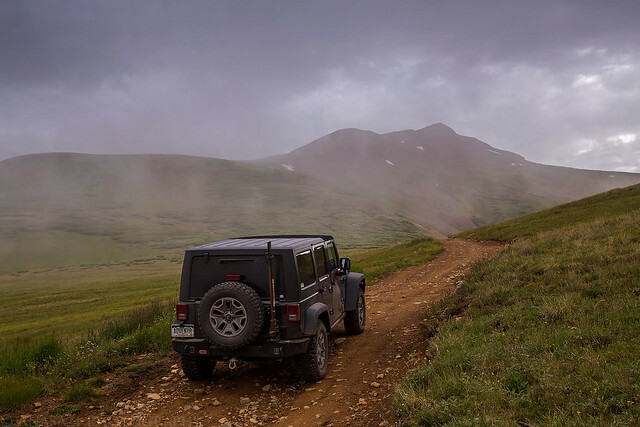 There were still occasional storms moving through the area so we decided to go for a drive over Slumgullion Pass and Spring Creek Pass to check out North Clear Creek Falls and explore a few of the roads in the area that went to reservoirs. 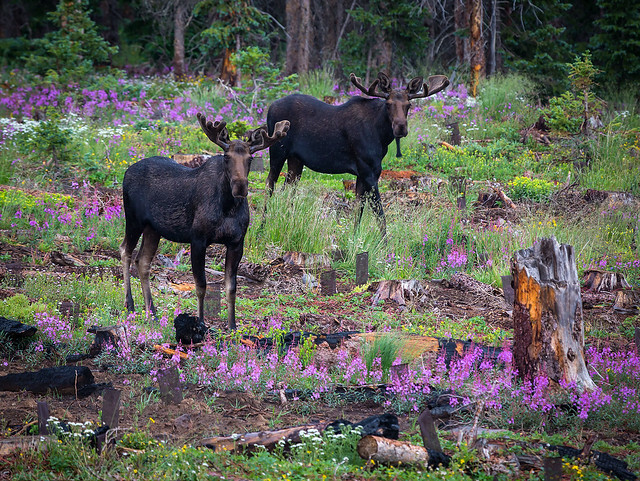 After driving over Slumgullion Pass we spotted these two moose in the fireweed not far from the road. Further off in the distance Diane spotted another moose with a calf, but they were too far away for photos. 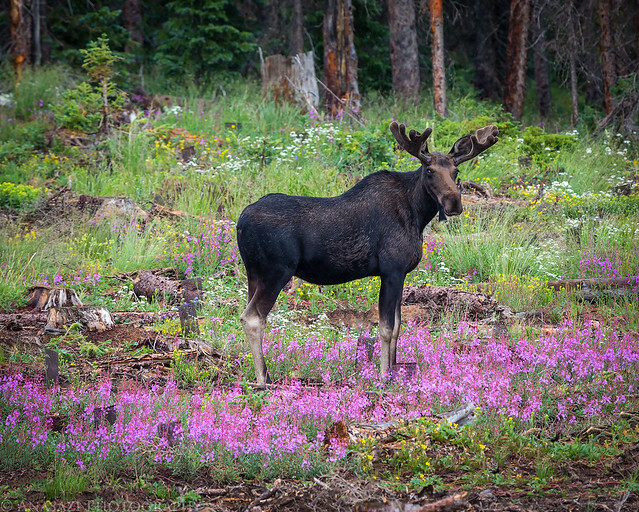 On our way back to town Diane would spot another two moose near the Slumgullion Campground. Moose seemed to be everywhere we looked today! 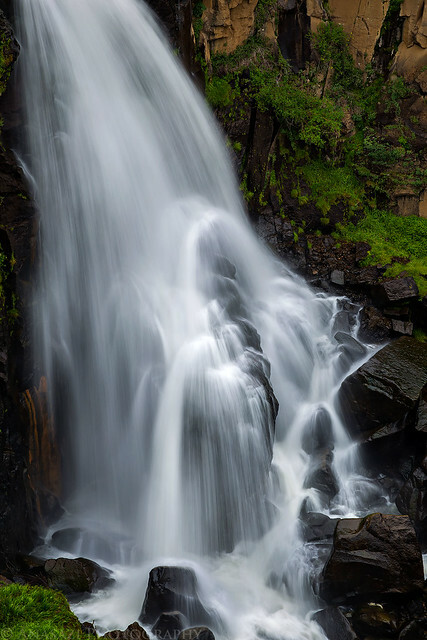 We stopped at North Clear Creek Falls since Diane had never been here and it had been a long time since I last stopped here. 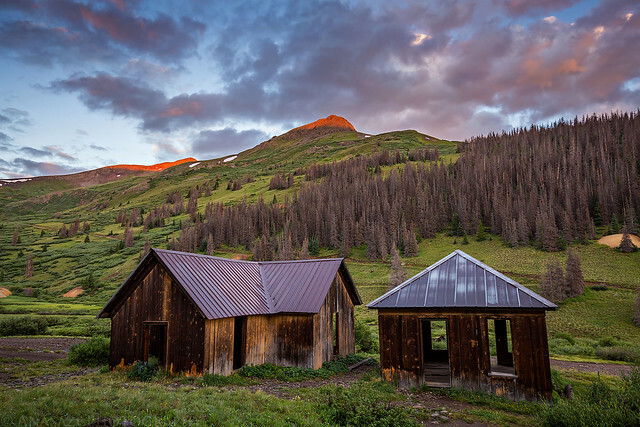 After returning to Lake City and topping off the fuel tank in my Jeep, it was time to drive up into Wager Gulch to find a campsite for the night. We ended up finding a nice site near the ghost town of Carson. 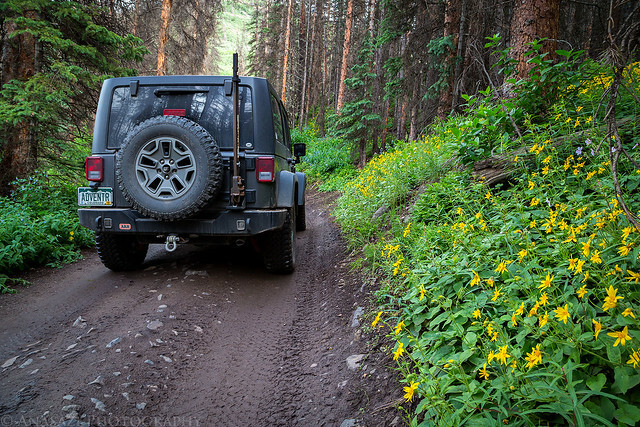 There were plenty of wildflowers along the road into Wager Gulch. After our camp was setup, Diane rested in the tent while I went for a drive up to the Carson Saddle so I could scout things out for our hike in the morning. 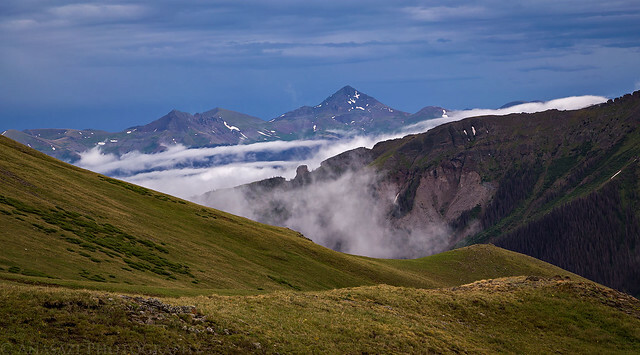 Just as I arrived at the pass, low clouds moved into the area and obscured my view, but they made for a few nice photos. I explored a few of the roads up here that led to old mines and other trails and then returned back to camp for a late dinner. Low clouds moving in near the Carson Saddle with Bent Peak straight ahead. 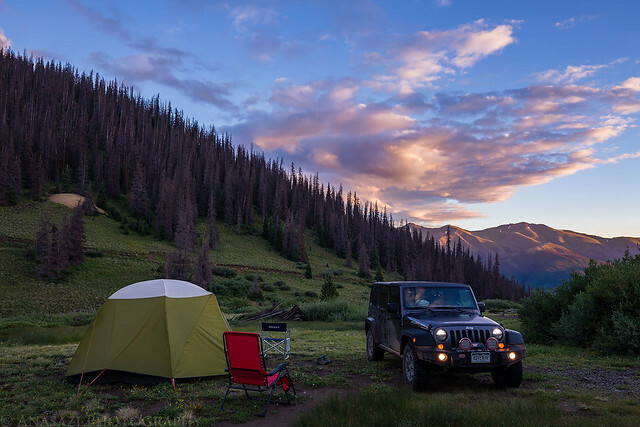 Driving along the Continental Divide with Redcloud (14,034) and Sunshine Peaks (14,001) above my Jeep. A nice view to the Rio Grand Pyramid. After dinner as we were getting ready to get in the tent for the night, a mama moose with her calf came out of the forest and walked right through our camp! They stopped at the nearby creek for a few minutes and then continued on into the forest on the other side of the gulch. I think we saw more moose today than either of us has seen in our entire lives, and this was certainly the closest encounter we’ve had. I didn’t have my camera handy, so no photos of this encounter. 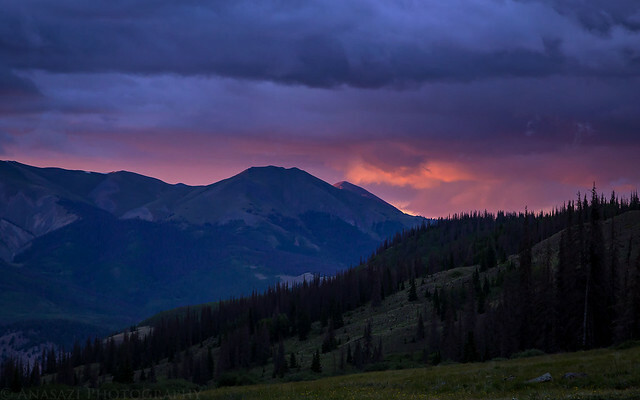 There was a brief touch of color in the sky over Grassy Mountain (12,821) and Red Mountain (12,826) at sunset. It had been a while since there was any precipitation in the area, so we thought that the rain was done for the day as we get into our sleeping bags for the night. However, it started to rain pretty heavily when we were in the tent for the rest of the evening, which would help serenade us to sleep. I woke up shortly before sunrise on Sunday to take a few photos of the sunrise before getting ready to hike. There were still a few clouds left in the sky which picked up a little color. 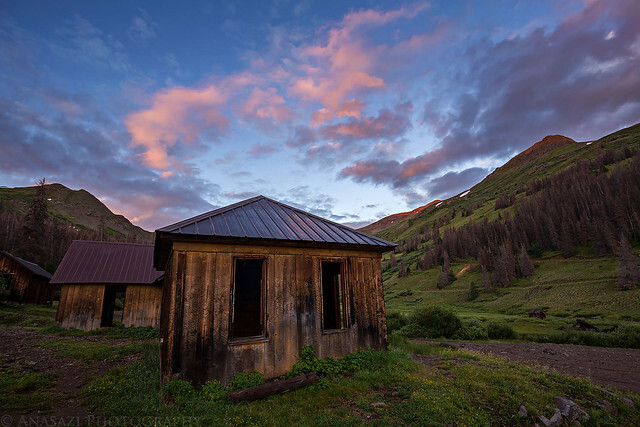 Sunrise at camp in Wager Gulch on Sunday. The ghost town of Carson. The orange peak in the background is Bent Peak, which would be our first destination this morning. When the light show was over we drove up to the Carson Saddle above camp, parked the Jeep there, and started hiking to the summit of Bent Peak (13,393). 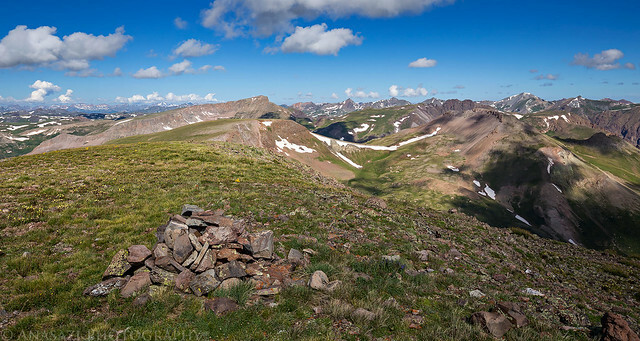 It was a pretty easy hike and offered great views across the valley to Redcloud and Sunshine Peaks and over to Handies Peak. 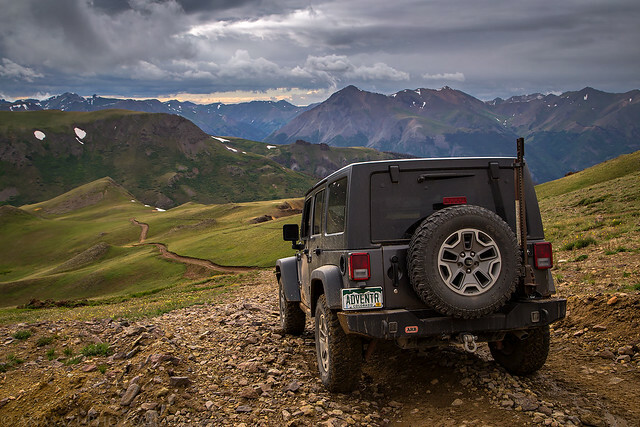 After driving up to the pass we parked the Jeep and started hiking to the summit. Nice clouds moved in overhead as we hiked to the summit. 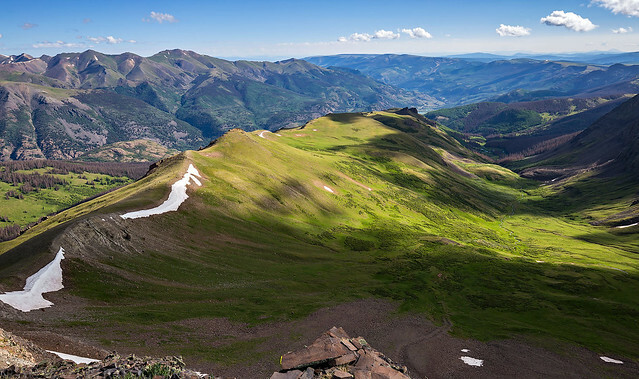 The view from the summit across the valley to Redcloud and Sunshine. From the summit of Bent Peak we dropped down to the saddle and then climbed up to the summit of Carson Peak (13,657). 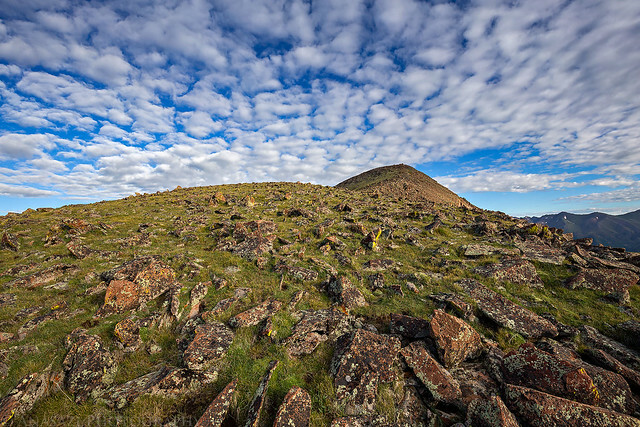 Much of the route was easy across the alpine tundra, but there was one or two easy scrambling sections along the narrow ridge just before the summit. Near the lowest part of the saddle we scared up a ptarmigan with four little chicks that were hidden well in the tundra. 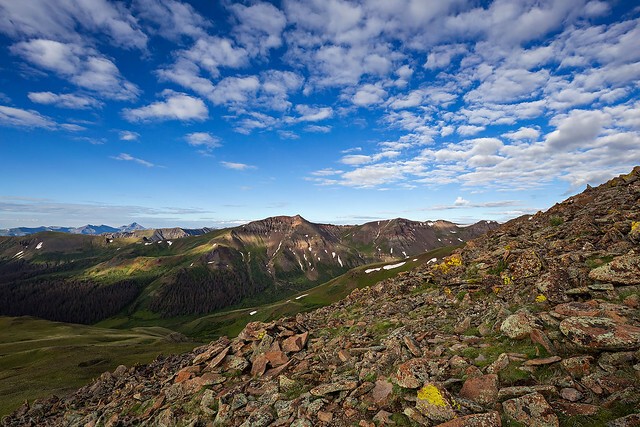 A view of Carson Peak as we descended from Bent Peak. You can see our entire route in this photo. Following the ridge to the summit. Looking down the West Fork of Wager Gulch. 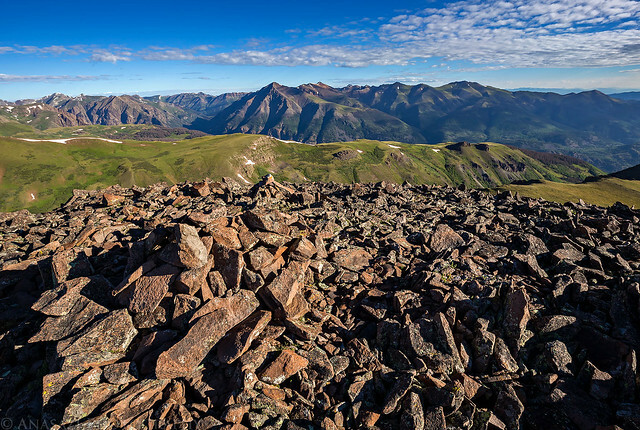 A grand view from the summit of Carson Peak. 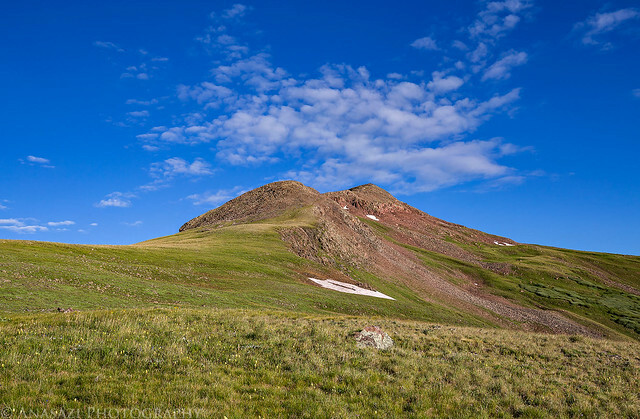 I was a little surprised when I got home and realized that this is the highest 13er I have climbed so far. I think I will have to work on some higher ones soon. From the summit of Carson we hiked down the ridge on the other side and hoped to descend to an unnamed pass of the Colorado Trail that we could take back to my Jeep. 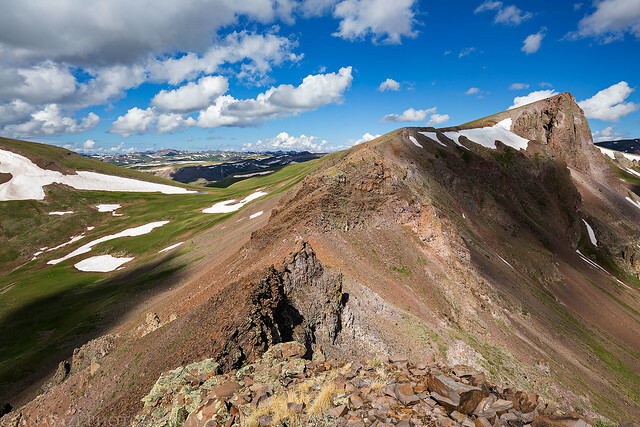 Unfortunately, we came across a very narrow, loose, and exposed section of the ridge that we could not get past, so we ended up descending a steep grassy slope straight down to the trail below instead. It was slow going because of the steepness, but we made it down without any issues. 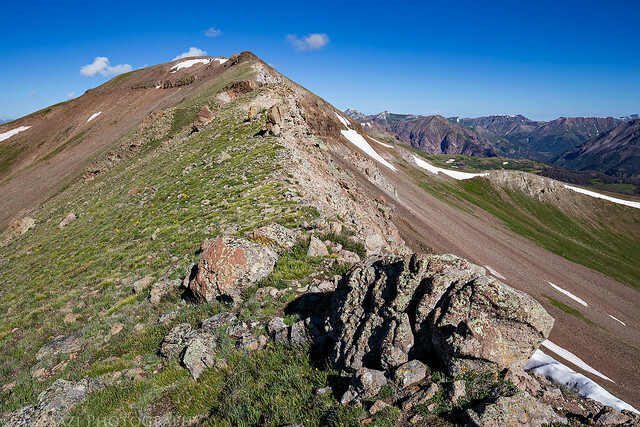 Once we were on the Colorado Trail in the Lost Trail Creek drainage we followed that back to the Carson Saddle to complete the loop. We drove back down to camp, packed up our tent which was now completely dry, and then drove straight back home without any other stops along the way. 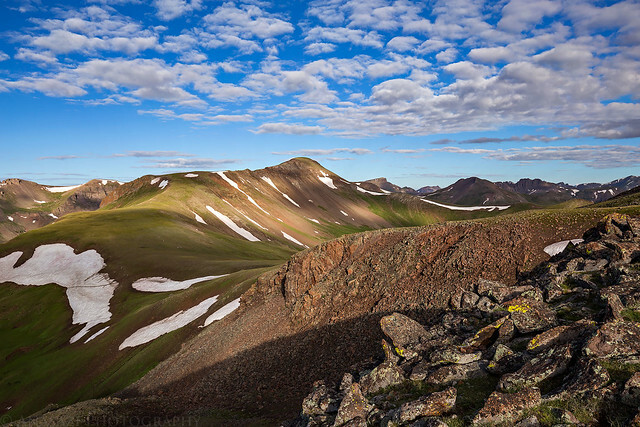 Following the ridge down towards Tundra Top (13,450) with Half Peak (13,841) just beyond. Unfortunately, we would not be getting across this section of the ridge as it was too exposed and loose for me. 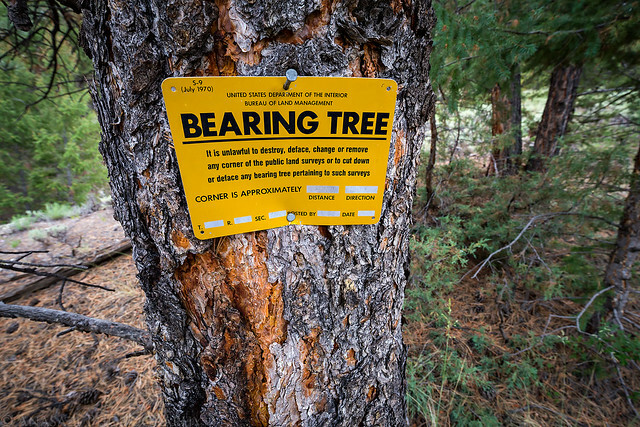 Instead we descended a steep grassy slope down to the Colorado Trail. 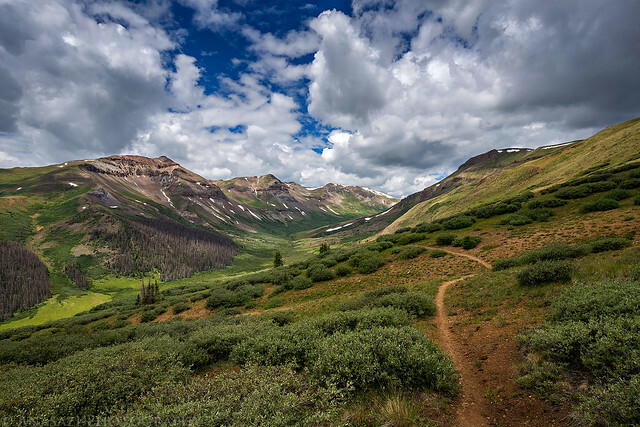 Looking back up the Lost Trail Creek drainage as we followed the Colorado Trail / Continental Divide Trail back to my Jeep.